One of Great Britain's most significant Military-UFO incidents happened at Rendlesham forest in Suffolk on three consecutive nights in late December 1980. Rendlesham is a vast pine forest east of Ipswich that is near Orford Ness. There is a prominent lighthouse (of which we will discuss later),as well as some other buildings that were situated on this island. In 1980, they were rumoured to be operated by the National Security Agency (NSA) - one of the US's most covert intelligence units. Stories of Top Secret experiments were rife, although the official function of the buildings was given as a site for research into 'over the horizon' radar. Gordon Levitt lived in an isolated house on the edge of the forest in Sudbourne. On December 26th, 1980, he had been out in the garden with his dog when he suddenly looked up and spotted a peculiar object flying towards them. The UFO looked like an upturned mushroom with a greenish-white glow. The craft soon silently passed them and carried on towards the twin NATO air bases of RAF Woodbridge and RAF Bentwaters. The next morning, Levitt's dog became ill - cowering in its kennel as if afraid to come out. Its condition worsened and it died a few days later. By the east gate of RAF Woodbridge that night were US Air Force security patrolmen John Burroughs and Budd Parker. They soon spotted the strange craft and at first thought that it may be a plane about to crash, however they soon realised that the craft was hovering downwards and eventually landed in the woods. They could see a pulsating mass of coloured lights, described by witnesses as looking like a Christmas tree. Burroughs quickly phoned the base. It was 2 a.m. and there should not have been any aircraft in the vicinity. Within minutes, security patrol sergeant Jim Penniston was on his way by jeep, driven by Herman Kavanasac. Once they arrived, they too saw the strange craft, lights were flickering through the trees and Penniston, who took command, tried to persuade Burroughs and Parker that a plane had crashed and was blazing out of control. But the two patrolmen knew that what was out there had landed and not crashed. Budd Parker stayed at the gate while the others entered the forest. There was some kind of strange electrical field pervading the woods, the radio contact with the base began to break down. Penniston ordered Kavanasac to stay back near the road so they could use him to relay messages to the main base. Penniston and Burroughs continued deeper into the forest, it was at this point that the air became alive with energy - crackling as if within a thunderstorm, even the mens hair stood on end, and their skin began to tingle. Penniston has said since the incident 'It was definitely not in the Jane's book of World Aircraft,'. He described it as a conical object about the size of a small car, floating on beams of light (others reported seeing thin legs) only 30 cms or so above the ground. It had a strange, misty aura and on its side were black marks that could have been writing. As the men tried to get closer to the object they described it as like trying to walk through treacle, as they could not seem to close in on the object. Suddenly, there was a flash of light, and the craft soared up into the air. That night there was an officers' party at RAF Bentwaters. Not long into this event Lieutenant Bruce Englund entered the room and told the base commander Ted Conrad that 'it' was back. As Conrad was just about to present an after-dinner speech, he asked his deputy, Lt Col Charles Halt, if he could sort out the matter. Deputy Base Commander Halt (later promoted to Lt Col Halt) gathered a team of skilled men, including Sergeant Nevells of the 'Disaster Preparedness' team and took a Geiger counter to measure radiation. Halt also took a dictaphone to help him make notes. Englund gathered light-alls (gas-powered arc lights), and the small party of men ventured out towards the edge of the base. A security cordon was set up around the perimetre of the woods to prevent any curious airmen or local villagers from getting in the way. An hour earlier a security patrol had spotted strange lights floating in the sky above the forest. But these lights had quickly disappeared. On entering the wood, the colonel was told that the UFO was no longer visible. However, the light-alls seemed to keep cutting out and he had to send someone to get more from the base. The team's radio communication (transcribed further in this article) both to the base and with each other were showing static interference, similar to that experienced the night before. Burroughs - hearing what was happening - decided to to join the group. But there was nothing unusual to see, except for a few stars and the pulsating light of the Orford Ness lighthouse and the Shipwash lightship further to the south. The men took several soil and tree bark samples as well as making radio observations of what they found. Out of nowhere all hell broke loose. Noises could be heard in the background as Halt cut in sharply telling his men to 'slow down' and take it carefully. The UFO was back. It had been spotted at 1.48 a.m. by a group of men who had ventured deep into the forest, which included John Burroughs and Sergeant Adrian Bustinza - who describes how the glowing light rested on a pillar of yellowish mist and split in the middle like a rainbow produced by a prism. Halt and his team had spotted the craft by now and said he initially considered mirages or weather-induced temperature inversions. Now the area of light resembled a huge eye with a dark centre. The group of men followed the light through the woods, crossing a farmer's field and stumbling through a small brook. Files detailing the Geiger counter readings taken at the scene were shown to experts by Nick Pope in 1994 who asses radiation levels for the government. According to Pope, they expressed surprise at the recordings and confirmed that the figures were ten times the expected background levels. 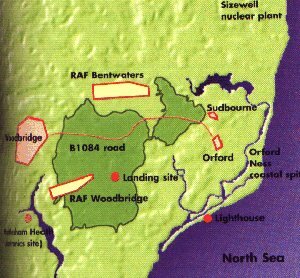 Suspicion centred on the presence of nuclear weapons at RAF Bentwaters - which was denied by the base and the British government at the time. More than a decade later, it was admitted that this denial was untrue. 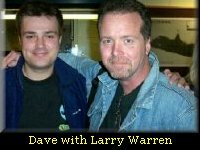 Larry Warren, a member of the US Air Force Security Police, was posted to England on 1st December, 1980. Just a few weeks later, he was involved in the bizarre encounter that occured in Rendlesham Forest. He says ' I was taken off my post to the forest, with a number of the other personnel who were bringing lighting equipment out used to illuminate large areas, but it wouldn't work because of a mechanical malfunction. We still had no idea what we were up to. A dim red light, opposite the Orford lighthouse, stopped over a strange mist on the ground. It quickly transformed into a triangular object covering approximately 30 feet (10 metres), going to a sharp pyramid about 20 feet (6.6 metres) in height. It had a solid structure, with a rough surface. Some of the group ran away, others stayed put, like myself. I couldn't move - i don't know whether it was shock or if it was outside influence. It was dreamlike... I think time was distorted and perceptions were intentionally affected by this intelligence. There was one reality and in front of you was another. I felt slower on that night. Everything was on half speed and something was wrong - something was out of place. East Anglia has always had extensive radar coverage, ever vigilant for a possible invasion from across the North Sea. This ensured that the object seen on 26th of December was detected. At RAF Neatishead, an unidentified object appeared on the radar and created panic in the control room. It returned no signal and was outperforming the RAF's finest aircraft. As they lost it off screen at a phenomenal speed, the matter was subject to a major investigation. The Neatishead radar tapes and those from nearby RAF Watton were requisitioned three days later. Remarkably, when USAF intelligence officers visited Watton to collect the film, they claimed that a UFO had crashed into the forest. Senior officers from a nearby USAF airbase witnessed the event, they said, and they had even seen aliens floating in beams of light underneath the spacecraft. Incredibly, the radar officers were not even told to keep this extraordinary story secret. By the end of 26th of December, US Deputy Base Commander Charles Halt and his British liaison officer - Squadron Leader Donald Moreland - were in discussions with their respective governments. A 'stand-up' meeting involving senior staff was held, and it was decided not to make any public revelations about the case. Soon, top-secret flights were arriving at the twin bases of Bentwaters and Woodbridge, and staff from covert US intelligence agencies were involved. Officers Burroughs, Penniston, and the other witnesses, were cut out of the loop. So too were senior personnel at the base - even deputy base commander Charles Halt was not allowed to know what was going on. Had the cover-up begun? Some sceptics have suggested various explanations for this event, including the lighthouse being seen from the forest, an experiment to see what the men's reaction would be to a threat close to a nuclear base, and even a meteor. If this is indeed the case, how can they explain the radar sightings? Below is the report that Lt Col Halt Filed concerning the incident at Bentwaters, Suffolk, United Kingdom. 1980. Below is a transcript and copy of the audio tape. Col. Halt:150 feet or more from the initial, I should say suspected impact point. Have a little difficulty, we can't get the Lidall to work. Seems to be some kind of mechanical problem. Going to send it back and get another Lidall. Meantime were going to take some readings with the Geiger counter and uh, stick around here a little bit waiting for another Lidall to come back in. Soldier: Let's mark one at a time, that's pod number. Halt: OK., were now approaching the area within about 25 or 30 feet. What kind of readings we getting? Anything? Halt: Five clicks. Where are the impressions? Halt: Is that all the bigger they are? Soldier: Well there's one more well defined one over here. Halt: Can we read that on the scale? Soldier: Yes Sir, we're now on the 5/10ths scale, and were reading about, uh, the third or fourth increment. Halt: OK., we're still comfortably safe here. Halt: Let's go to the third one over here. Soldier: Yes, now I'm getting some residual. Halt: I can read that, the meter is definitely giving....low pulse. Lets go to the centre of the area next and see what kind of reading we get out there. You're reading the clicks, I can't hear the clicks. That about the centre Bruce? Halt: OK., lets go to the centre. That's the best deflection needle I've seen yet. O.K., can you give me an estimation. Soldier: We're on the point five scale, and we're getting, we're getting right at, uh, a half of a milliroentgen. Soldier: I haven't seen it go any higher. Soldier: Now it's picking up. Halt: This is out toward the Level One indentation where we first got the strongest reading. It's similar to what we got before. Soldier: This looks like an area here possibly that could be a blast. Soldier: It just jumped to 17. Soldier: It just jumped to 7 tenths. Halt: Seven tenths, right there in the centre? Halt: We found a small blast, what looks like a blasted, or, scruffed up area here. We're getting very positive readings. Lets see, is that near the centre? Halt: Up to seven tenths. Seven units lets call it on the point Five scale. O.K., why don't we do this. Why don't we make a sweep. Soldier: Here, I got my gloves on now. Halt: about 10 foot out. Make a perimeter run around it, starting right back here at the corner. Back at the same first corner where we came in. Lets go right back here. I want to depend on you to count the clicks. Halt: OK. lets...right put the light on it, lets sweep around it. Put it on the ground every once in a while. Soldier: This looks like an abrasion on the tree. Halt: O.K., we'll catch that on the way back, lets go around, hit it there. Soldier: I got an interesting one over here, looks like an abrasion point into the centre. Halt: It is. It may be old though, there's some sap marks or something there. Lets go on back around. Soldier: They ought to give us an extension on that. Halt:Yeah, this is an awkward thing to use isn't it. Are we getting anything further?, I'm going to shut this recorder off until we find something. Halt: Picking up? What are we up to? We're up to 2 3 units of deflection. You're getting in close to one pod. Soldier: Picking up something here. Picking up. Halt: Ok., its still not going above 3 or 4 units. Soldier: Right. It's picking up more though. More frequent. Halt: Yes, you're staying steady up around 2 to 3...to 4 units now. Soldier: Get one of these trees that's facing the blast. What we assume is the landing sight. All around an abrasion that's facing in the same direction towards the centre. Halt: That's interesting, lets go this way around the circle. Turn it back down here. Halt: Let me see that. You know that's kind of funny, that's, your right about the abrasion. I've never seen a tree that's, uh, never seen a pine tree that's been damaged, react that fast. Soldier: I have a bottle to put that in. Halt: Yeah, you have a sample bottle? Halt:Yeah, put this stuff in. Soldier: You notice their all the same colour. Halt: OK., from now on lets, lets, lets identify that as point number one. That stake there. So you all know where it is if we have to sketch it. You got that side Nevells? Halt: O.K., closest to the Woodbridge Base. Soldier: That will be point one. Halt: Be Point one. Lets go clockwise from there. Halt: Point Two, so this tree is between point two and point three. Halt: Tell them negative at this time. We'll tell them when they can come out here. Don't want them out here right now. O.K., the sample, your gonna want this sample number one. Halt: Strange, there's a crystalline pine sap that's come out that fast. You say there's other trees here that are damaged with similar things? Soldier: Yes, over towards the landing sight. Halt: O.K., why don't you take a picture of that, and remember your picture. Hey, you ought to be writing this down. Well, it's going to be on the tape. Soldier: You got a tape measure with you? Halt: Are you getting any readings on the trees your taking samples from?, on the side facing the suspected landing sight? Halt: Up to 4. Interesting. That's right where you're taking the sample now. Halt: That's the strongest point on the tree? Soldier: If you come up to the back, there's no clicks whatsoever. Halt: No clicks at all on the back, it's all on the, the side facing the...interesting. All the tissues look like something twisted it, as it sat down on them. Looks like someone took something and sat it down and twisted it from side to side. Halt: Very strange. We're up at the same tree we took the sample off with this, what do you call it, starscope? Halt: Getting a definite heat reflection off the tree, about three to four feet off the ground. Soldier: Yes. At the same spot. Soldier: On the spot on the tree directly behind us, I picked up the same thing, the one off to your right. Halt: Three trees in the area, immediately adjacent to the sight, within ten feet of the suspected landing sight, we're picking up heat reflection off the trees. What's that again? Soldier: Well, shine the light on it again Bob. Halt: You having trouble? O.K., turn the light on. Soldier: When you turn the light on, you'll notice the white. Halt: You're right there's a white streak on the tree. Halt: Let me turn around and look at this tree over here now, just a second. Why don't you direct it towards this tree. I can see it. O.K., now give me a little side lighting so I can climb the tree. O.K., uh, I lost the tree. O.K., stop, stop. Light on. Hey, this is eerie. This is strange, here, someone want to look at the spots on the ground. O.K., lets step back and not walk all over it. Come back here and somebody put a beam on them. We're going to have to come back 10 or 15 feet. O.K., lights off. Yeah. O.K., that's what we'll call spot number 3. Lets go to the back part and get spot number one. Spot number one, here's spot number one right here. Spot number one right here. Need some light? There it is right there. Focused? O.K., look around spot number on through the Starlight scope. Soldier: Picking up a slight increase in light as I go over it. Halt: Slight increase in light at spot number one. Lets go look at spot number two. Halt: Spot number two's right over here. Right here, see it? O.K., get focused on it, tell me when. O.K., lights on, lets see what we get on it. Halt: Just a slight increase? Soldier: I'll try to centre it. Halt: It's slightly off centred, it's right there. Better get your reading on it right there. Halt: Tell me when your ready. Halt: O.K., lights on. This is the centre spot we're looking at now, or almost the centre. Halt: Slight increase there. This is slightly off centred toward the, uh, one two side. It's some type of abrasion or something in the ground where the pine needles are all pushed back and we get a high reading about, uh, deflection of two to three, maybe four, depending on the perimeter. Soldier: Yes, you say there's a positive after effect? Soldier:Yes, there is definitely...that's on the centre spot. Soldier: There is an after effect. Soldier: Heat or some form of energy, hardly heated at this stage of the game. Halt: Looking directly overhead, one can see an opening in the trees, plus some freshly broken pine branches on the ground underneath. Looks like some of them came off about 15 to 20 feet up. Some small branches, about an inch or less in diameter. Halt: It's 0148, we're hearing very strange noises out of the Farmer's barnyard animals. There very, very active making awful lot of noise. You just saw a light? Where? Halt: Wait a minute now, slow down, where? Soldier: Right up in this position here, straight ahead, in between the tree...there it is again! Watch. Straight ahead off the flash back there Sir. There it is. Halt: Yeah, I see it too. What is it? Soldier: We don't know Sir. Halt: Yeah, it's a strange small red light, looks to be maybe a quarter to a half mile, maybe further out. I'm going to switch off for awhile. Halt: The light is gone now, it was approximately 120 degrees, is it back again? Halt: Well douse the flashlights then. Lets go out to the edge of the clearing so I can get a better look at it. See if you can get the Star scope on it. The light's still there and all the barnyard animals have gotten quiet now. Yeah, we're heading about 110 or 120 degrees from the sight, I'm through to the clearing now, still getting a reading on the meter. About two clicks. Just counted 3 to 4 clicks, getting stronger. Soldier: Now it's stopped. Now it's coming up, hold on, there we go. About 4 foot off the ground with a compass heading of 110 degrees. Halt: Turn the meter off, now say that again. About 4 feet off the ground, about 110 degrees, getting a reading of about 4 clicks? Soldier: Yes Sir. Now its died. Halt:Now its died. I think it's something other than the ground. I think its something that, something very weird. Halt: We just _______ the first night _______ we've seen. We're about 150 or 200 yards from the sight. The woods are just deadly calm. There is no doubt about it, there's some type of strange flashing red light ahead. Halt: I saw a yellow tinge in it too. Weird, it, it appears that he may be moving it this way? It's brighter than it has been. Soldier: Two lights, one light to the right, one light to the left. Halt: O.K., keep the flashlights off. There's something very, very strange. Keep the headset on, see if it gets any stronger. O.K., give us a rundown. Soldier: Notation that this is on a Beta reading too. Halt: It's on a Beta reading, O.K. Soldier: But it still has been removed. Halt: Pieces are falling off it again. Soldier: And it just moved to the right. Soldier: Just off to the right. Halt: Strange...Why did it go left? Halt: Lets, lets approach to the edge of the woods up there, O.K.? You wanna do without lights? Lets do it carefully, come on. Halt: O.K., we're looking at the thing, we're probably about 2 to 300 yards away, it looks like an eye winking at you. It's still moving from side to side, and when you put the star scope on it, it, it sort of has a hollow centre, a, a, dark centre. It's, It's, you know, like the pupil of an eye looking at you, winking. And the flash is so bright to the star scope that, a, it almost burns your eye. Halt: We passed the Farmer's house and crossed into the next field, and now we have multiple sightings, of up to 5 lights with a similar shape and all. But they seem to be steady now, rather than a pulsating or glow with a red flash. Halt: We just crossed the creek. Soldier: Here we go, strong. Halt: And, uh, we're getting what kind of readings now? Halt: Three good clicks on the meter and we're seeing strange lights in the sky. Halt: At 0244 we're at the far side of the Farmer's, second Farmer's field. And made sighting again, about 110 degrees. This looks like it's clear out to the coast, it's right on the horizon. Moves about a bit, and flashes from time to time. Still steady or __________ encounter. Also after negative readings in this other field, we're picking up, a, slight readings, a, 4 or 5 clicks now, on the meter. Halt: 0305, we see strange strobe like flashes to the, rather sporadic but there's definitely something, some kind of phenomena. Halt: 0305, at about 10 degrees horizon, directly North, we've got two strange objects, uh, half-moon shaped, dancing about coloured lights on them. At, uh, what I would guess to be about 5 to 10 miles out, maybe less. The half-moons are now turning full circles. It's as though there was an eclipse or something there for a minute or two. Halt: 0315, now we've got an object about 10 degrees directly South. 10 degrees off the horizon. And the ones to the North are moving. One's moving away from us. Soldier: They're moving out fast! Soldier: This one on the right is heading away too! Halt: And they're both heading North. Here he comes from the South, he's heading toward us now. Now we're observing what appears to be a beam coming down to the ground. This is unreal. Halt: 330, or 0330 and the objects are still in the sky although the one that's South looks like it's losing a little bit of altitude. We're turning around, heading back towards the base. The object to the, the object to the South is still beaming down lights to the ground. Halt:0400 hours, one object still hovering over Woodbridge Base at about 5 to 10 degrees off the horizon, still moving erratic, and similar lights, and beaming down as earlier. If you require further information about this incident we recommend the book 'Left At East Gate' which is written by Larry Warren and Peter Robbins. In the station record report dated 26/12/80 it states that 'We have had a call from the L.E. at Bentwaters in reference to the U.F.O. reported last night, we have found a place where a craft of some sort seems to have landed'. But then the report goes on to say 'There were three marks in the area which did not follow a set pattern. The impressions made by these marks were of no depth and could have been made by an animal. PC Cresswell attended'. One thing that strikes me as odd in the document is the part which says ' Result - There were three marks.... It seems as though it is not an original part of the document because the photocopy stripes that run down the page are not visible? Is this somebody tampering with so called information that should be freely available? Here are the FOI documents if you wish to read them. The events of December, 1980 were not the first, or the last to involve the base with UFOs. On the night of the 13th and 14th of August 1956, several UFOs were picked up on military radar flying at fantastic speed at 9.30 p.m. At 10.55 p.m. ground radars at Bentwaters picked up a target coming in from the sea at 2000-4000mph (3200-6400km/h). The UFO flew directly over the base and disappeared from the screen 30 miles(50km) to the west. At the same time a control tower operator saw a bright light streak over the airfield, and the pilot of a USAF C-47 Dakota which was flying at 4000ft (1200m) above the base saw a fuzzy light flash between the plane and the ground. The UFO appeared on radar at Lakenheath, performing weird aerobatics. The base alerted the RAF, who scrambled a Venom NF2a fighter from RAF Waterbeach. The Venom pilot soon made visual and radar contact, and reported that his guns were locked onto the target. Suddenly the UFO flipped over and came up behind the fighter, which unsuccessfully tried to shake it off. A second Venom joined the first, but found nothing. Two Lockheed T-33s returning to Bentwaters also joined the hunt for 45 minutes, but also found nothing. The UFO was last seen on radar heading north at a steady 600mph (1000km/h). In all seven radar, one airborne, all reported five seperate incidents. Twenty radar personnel were involved, and there were nine visual observers. The Condon committee called this 'the most puzzling and unusual case in the radar-visual files', and concluded: 'the apparent rational, intelligent behaviour of the UFO suggests a mechanical device of unknown origin as the most probable explanation'. Did UFOs return to Rendlesham Forest in 1998? Cosmic Conspiracies were lucky enough to be a part of a UFO radio phone-in on national radio station 'Talk Radio' in November, 2000. The special guest on the show was Nick Pope, one time head of the UFO desk at the MOD (Ministry Of Defence - UK). Half way through the show a listener telephoned into the station to talk about what he and 19 others (including 2 police officers) had witnessed at RAF Bentwaters in 1998. The gentleman proceeded to explain how they saw strange lights and 'static-like' flashes appear over the runway! Apparently, a press conference was held several weeks after the incident with a local newspaper because the witnesses were angry that the paper had made a mockery of the events when it was reported in the paper. A spokesman for the paper stated that a Government department had contacted the paper to inform them to play down the event, in an attempt to make the whole event look like a prank. If any reader has further information regarding this incident, we would urge you to EMAIL us, as this is the first and only time we have ever heard of this event. I heard from Brenda Butler that these sightings are taking place on a regular basis. I also heard something about locals complaining that the press were holding back information due to a government D-notice. In my own experience with the local press I found no such problems. They have covered in detail some extracts from my book that would really upset the government. I think it's more a point that they receive so many reports about sightings in the area that they don't want to overdo it. I know nothing about police officers being involved.